Looking for that right shark stuffed animal gift for your little one or that special occasion? Look no further than our handpicked selection of plush shark toys including our stuffed Great White Shark! With programs such as Shark Week on The Discovery Channel, more adults and children have become fascinated with sharks. Our sharks are some of the cutest and loving in the animal kingdom. 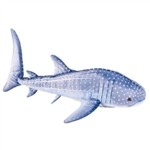 Find the right stuffed animal shark with our line of plush toys featuring the famous Great White Shark, Sand Tiger Shark, Blue Whale Shark, Stuffed Hammerhead Shark and the exotic Leopard Shark. If you are looking for a particular type of stuffed animal shark please feel free to email me. We are constantly looking for new types of sharks and toys so we may have what you are looking for.